You may remember that I'm busy patterning and constructing an 1889 dress for my Draping class with Marianne Krostyne. 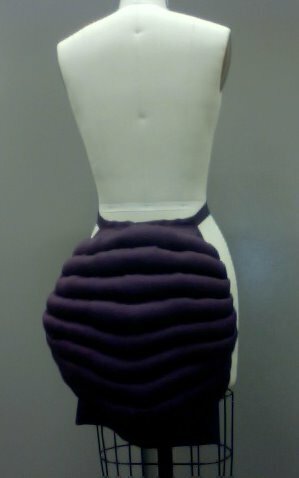 For the understructure of my dress I constructed this bustle pad using the Laughing Moon pattern. I was really pleased with the way it went together. Hopefully the shape of it will look really nice under the skirt. 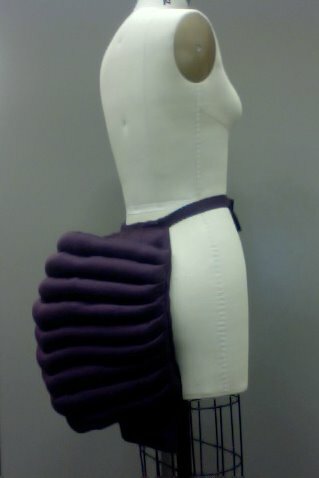 I made this bustle pad of a beautiful plum purple cotton sateen. It's really a lovely fabric. 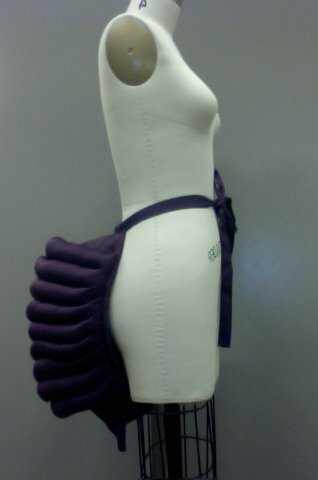 I'm planning to add a row of knife pleated fabric along the bottom eventually. I have to purchase some more fabric first. This looks wonderful. Is there a distinct difference between the 1870s/1880s/1890s? It is gorgeous! Almost makes me want to wear one! Very cool! I'd love to see close ups of the construction and how it is put together! Awesome job! Did you use the Laughing Moon pattern? Yes! I was inspired by your beautiful bustle, Rosie! I'm going to me making one of these soon, I was wondering how it felt to sit down in this bustle.